We chose this cruise about 6 weeks beforehand as we were looking for a winter getaway. I was looking at a few different options and I am very pleased with the choice we made. Starting with embarkation, the tone was set. Really efficient and seamless - we got our luggage quickly and from port to ship was fast and all staff were friendly! Although it was not perfect (what is?) there were so many positives on this cruise. Near or at the top of the list was the social nature of this cruise. We met so many nice people - I feel like the design of the ship really encourages chatting, social time and not rushing! Food was very good. Entertainment was a bit hit and miss - AJ the comedian was quite good, we had a group called the phat pack that were excellent (and not part of the cruise specific entertainment!) and some of the musical acts were fun and location appropriate (eg Mariachi) The colours of the world was not great for a variety of reasons and I found the show times of 630 and 830 really conflicted the dinner times. Dinner was typically at a leisurely pace and we missed quite a few shows. No matter, we just chatted with friendly passengers! We had an inside cabin which was ok but I think we will be back on a balcony next cruise. If you have not had a balcony you may not know what you’re missing. We did and noticed it! 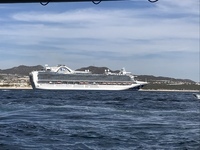 One other complaint was a one off - there was an unruly passenger that was picking a fight with another, much older passenger on the tender back from Cabo - I tried to alert the Princess Staff and nobody seemed to know what to do or act with a sense of urgency. I am guessing that it is not common on Princess which may explain why but it could have turned serious and they should have been quicker to act. Overall, loved the ship crew was good passengers were almost universally friendly. We will definitely be sailing with Princess again! We will book a balcony next time. Beds comfy but definitely VERY compact - shower small even by cruise ship standards. Overall good - the guide was very knowledgeable - a little boring and heavy on sales side. I would chose something different for myself next time but it would be fine for a first time if you want a taste of the city. Easily the worst part of our cruise. Excursion started 11 - almost entirely hard sales tour to leather shop, jewellery story with almost nothing of the interesting city around us. Took us on a tequila tastin within an hour and then did not give us an opportunity to eat until 3 pm!!!! Many people very hungry and struggling to keep up - after all of that tour guide actually Soliciting tips after what he knew was a terrible excursion - took his hat and asked each group individually. Also I&apos;m pretty sure I got food poisoning from the food which put a damper on the last two days of the cruise. I have No idea how these people remain in business.